We offer optimal quality Rotary Kiln Incinerator that help in carrying out disposal of waste materials. Treated wastes might be industrial waste or domestic. These systems reduce combustible waste into exhaust gaseous products and the incombustible waste into ash. Our systems are capable of reducing the weight of the wastes to a fraction of their original weight. Our products are duly lined with high grade castable cement and fitted with high quality gaskets to seal the doors when closed and limit switch will be provided. Combustion efficiency is at least 99%. minimum 1050° C + or - 50° C.
The secondary chamber gas residence time at least two seconds. Wastes to be incinerated are not chemically treated with any chlorinated disinfectants.Ash from incineration of waste is disposed of at common hazardous waste treatment anddisposal facility. However, it may be disposed of in municipal landfill, if the toxic metals inincineration ash are within the regulatory quantities. 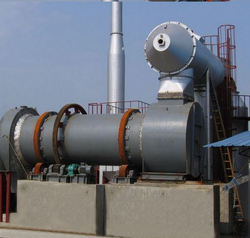 Looking for Rotary Kiln Incinerator ?